The Baruch Scholars Program admits entering first-year students. The program provides exceptional academic opportunities, supportive advisement and four-year full-tuition scholarships for in-state students and a generous tuition scholarship for out-of-state students. By mitigating the financial burdens, scholars can go above and beyond to pursue their intellectual interests and career goals through activities that include studying abroad, conducting independent research, and committing to year-long community service. By engaging in the New York community, Scholars can become cognizant of issues related to civic responsibility, social justice and diversity; central issues to a democratic society. The Baruch Scholars Program takes pride in the services it offers students and the professionalism of its advisors. By adhering to best practices, honors advisors help students make meaning of various dimensions of their identity and gain life skills that will help them succeed after graduation. They inform scholars about scholarship and professional development opportunities, and they have the ability to work one-on one-with students who are experiencing difficulty in their academic or personal lives. Enroll as a full-time student (12 – 18 units). Special permission is required for scholars who wish to take more than 18 units. You will be responsible for paying for units beyond 18. All first-year and sophomore scholars are required to meet with their respective honors advisor before enrolling for classes. Juniors and seniors are not required to meet with them, but are strongly encouraged to do so. Maintain a cumulative GPA of 3.3 up to the 59th unit and 3.5 after the 60th unit to graduate with College Honors. Complete at least 15 hours of community service per academic year. 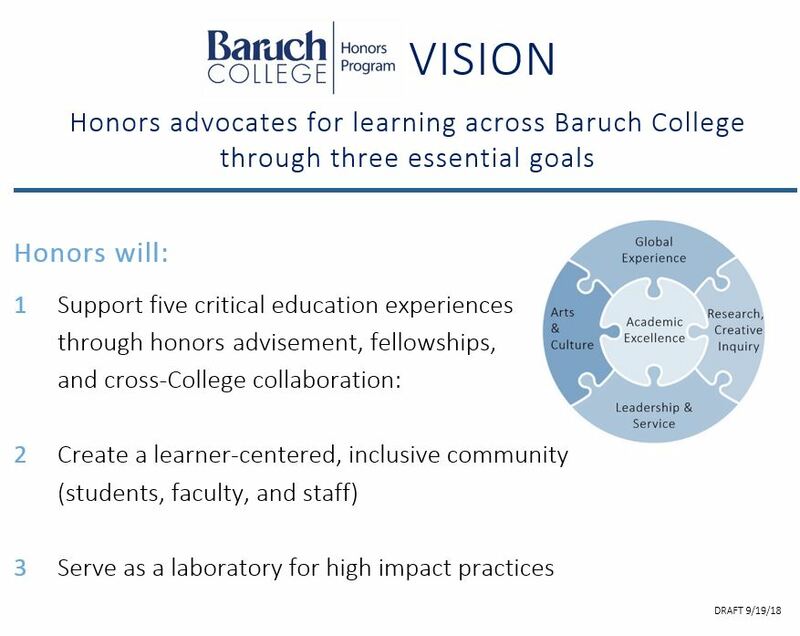 First-years are exempt from this requirement the fall semester at Baruch, but are required to complete at least 8 hours during the spring semester during their upper freshman year. The following are sample reflections written for specific volunteer opportunities. Use these as guides to inform your own written reflection: Sample A / Sample B / Sample C.
Attend an arts and culture event per semester. First-years are waived during their first semester. Weissman majors must take at least one Honors Feit Seminar (IDC 4050H) or Harman Writer in Residency Course or Honors Thesis. Baruch Scholars must file and complete a FAFSA and TAP (NYS residents only) application for the following ­­­academic year by March 31. Scholars are financially responsible for the Student Activities Fees, Technology Fees and Change of Program Fees associated with registration. For more information click here. Scholars must notify their advisor before dropping, adding or changing a class. International and Out-of-State scholars must consult with his/her advisor before dropping any courses, otherwise he/she may be liable for paying the cost of tuition for the number of credits being dropped. Scholars must notify their advisor, if they want to enroll for an Internship course after the beginning of a semester . Scholars are strongly encouraged to Study Abroad and/or engage in an internship related to their professional/academic interests. Scholars should consult with their advisor about their plans to study abroad. Financial aid such as Pell grants, TAP and subsidized loans may be applied to approved study abroad experiences that award credit and that last for at least one semester. Short-term study abroad experiences, as well as non-academic internships, volunteer opportunities, etc., that do not award academic credit may not be eligible for financial aid. For information about your eligibility for these grants and loans, and other important financial aid information, please consult the Financial Aid Office. Scholars are entitled to a grant ($ 1300) for the use of Study Abroad only. Fortify your relationship with your advisor, faculty, visiting employers, students, co-workers etc.